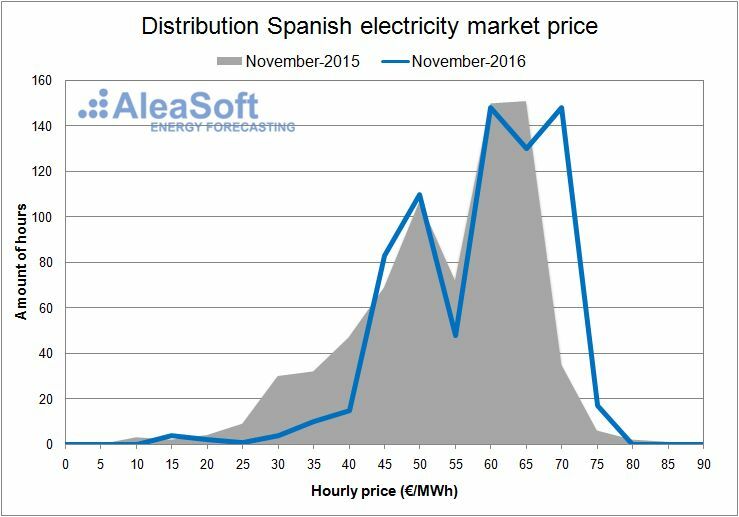 11th January 2017.‑ The price of the Spanish wholesale electricity market operated by OMIE in 2016 dropped by 10.66 €/MWh compared to 2015. 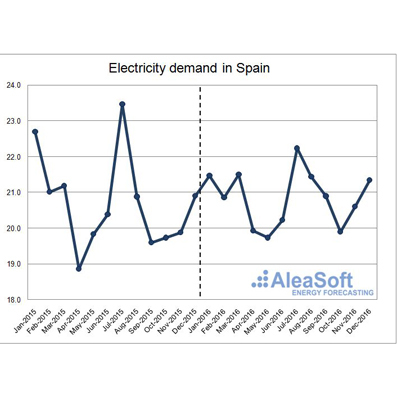 This decrease in the average price has been determined by the low prices during the first half of the year, mainly due to the increase in electricity production with less expensive technologies such as hydroelectric, wind and nuclear power, as well as the decrease during that period in the prices of fossil fuels used in the electricity generation. 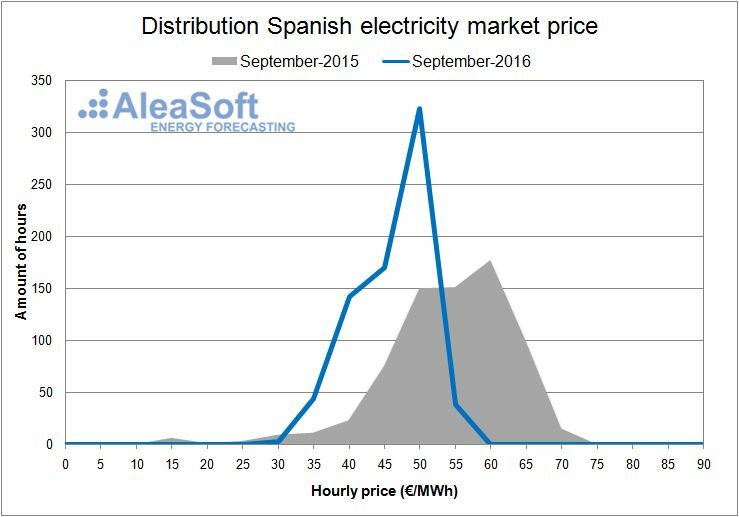 Also in 2016, the registered price increased in the last quarter due to the greater export of electricity to France due to the shutdown of nuclear power plants that happened in the neighbouring country. The increase in the production was covered by more expensive plants using gas and coal. The gap created in France by the reduced nuclear production was filled with the increase of the imports of energy, and with the increase of the production with coal-fired power stations that increased considerably the global demand for the mineral, as well as its price. 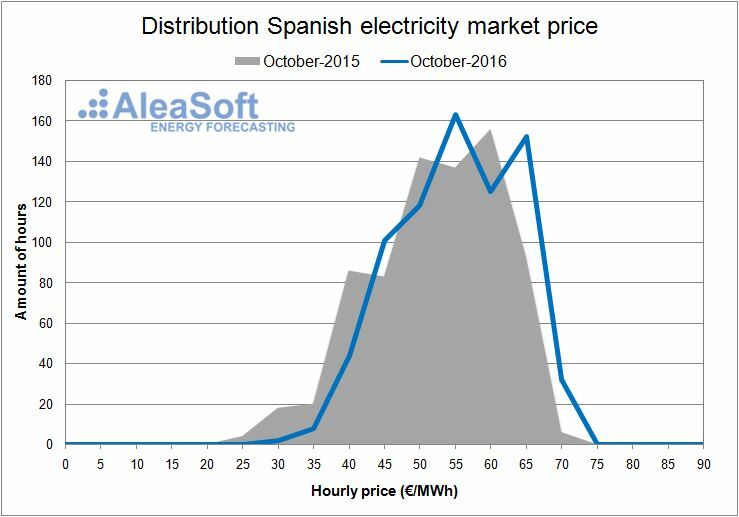 This also indirectly affected the cost of producing electricity in the Spanish market, and the consequent increase in the price in Spain. 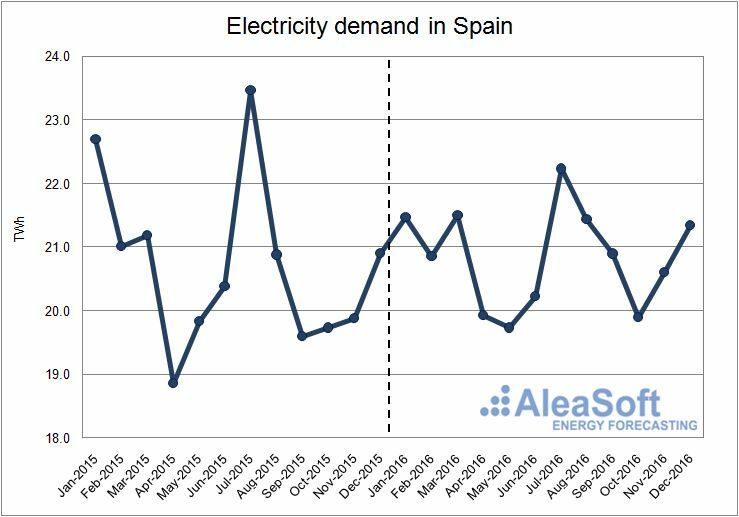 According to data published by REE (Red Eléctrica de España), the electricity demand in Spain in 2016 was 0.7% higher than that of 2015. However, once the effects of temperature and working patterns were corrected, growth has been null. September was the month with the highest year-on-year gross growth (6.7%), in that month temperatures were higher than in the same month of 2015. The Spanish economy is expected to grow by 3.2% in the year just completed. The high temperatures recorded in January 2016 have made demand relatively low that month, with a year-on-year gross decrease of 5.4%. The effect of the heat wave that covered the peninsula in July 2015 has affected the inter-annual variation of the gross demand in July of 2016 that has registered a fall of 5.3%. Wind power production declined by 0.9% in 2016. The fall in annual production was driven by a decline in production in the last quarter of the year, 19.6%, while the year-on-year growth accumulated during the first three quarters had been 4.8%. 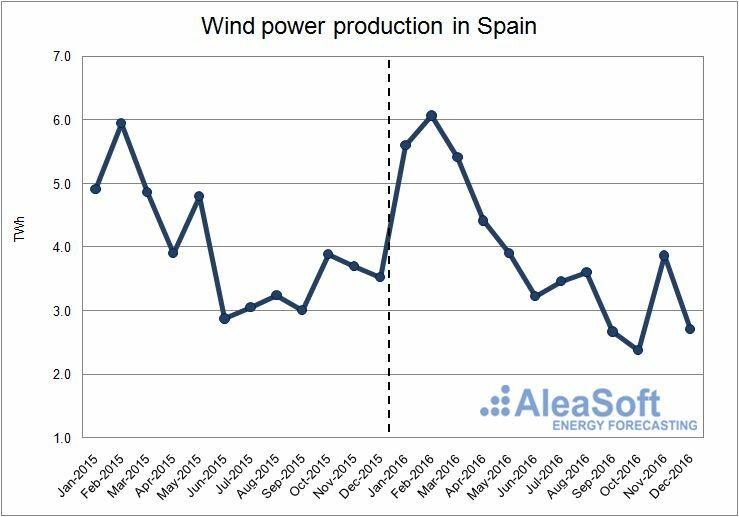 According to data published by REE, the wind power installed in Spain during 2016 has not grown. 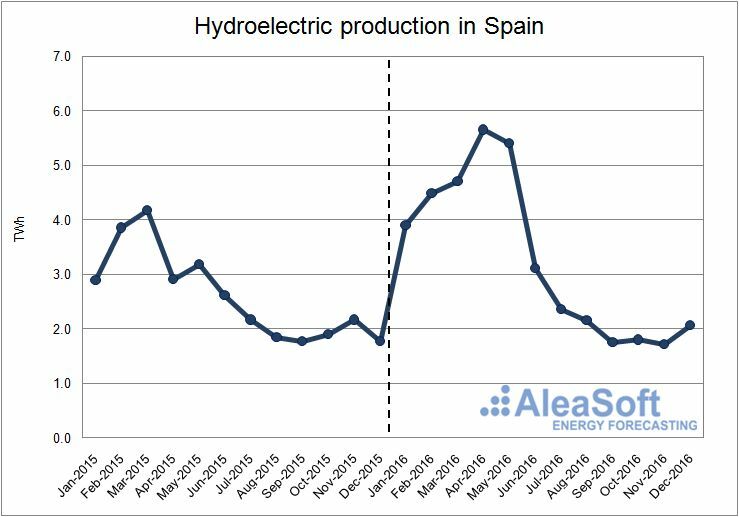 Hydroelectric production has increased sharply in 2016. Compared to 2015, the increase in production has been 25.2%, mainly focusing on the first half of the year, with a year-on-year growth of 38.9%. The increase in production in the months of April and May stands out, where growths were 94.3% and 69.4%, respectively. In the second half of the year, production has only changed by +2.0% compared to the second half of 2015. 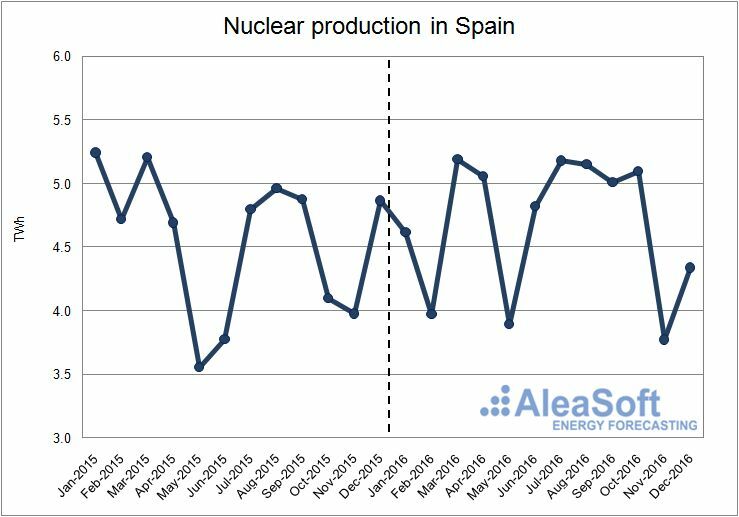 Nuclear production has grown slightly by 2.4% over the year as a whole, although relatively large inter-annual monthly variations have occurred between ‑15.8% in February and +27.8% in June. The generation of electricity using coal has been the technology that has registered the greater fall in 2016 with a variation compared to 2015 of 30.9%. The largest drop occurred during the first half of the year, ‑53.4%, mainly as a result of increased hydroelectric production in the spring of 2015. 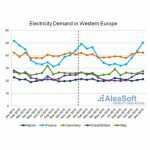 During the summer, the difference with 2015 has also been important due to the heat wave suffered last year that led to a significant increase in the demand for electricity which was covered, in part, with coal-fired power plants. At the end of the year, the differences with the previous year have lowered, due to the increase in coal production to cover the demand for exports to France. 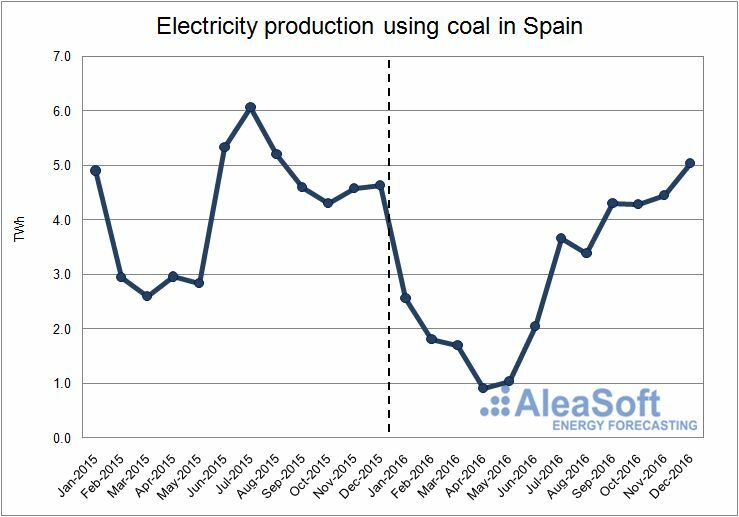 According to data published by REE, in mainland Spain, the installed capacity of coal-fired power stations during 2016 has been reduced by 932 MW. In the same way as coal production, combined cycle production has also been affected by the increase in hydroelectric and wind generation during the first three quarters of the year compared to 2015 (‑14.8%). However, during the last quarter, and also due to the increase in exports to France, production compared to the same period of 2015 has increased by 49.1%. Throughout the whole of 2016, the combined cycle production balance has had a slight increase of 2.4%. 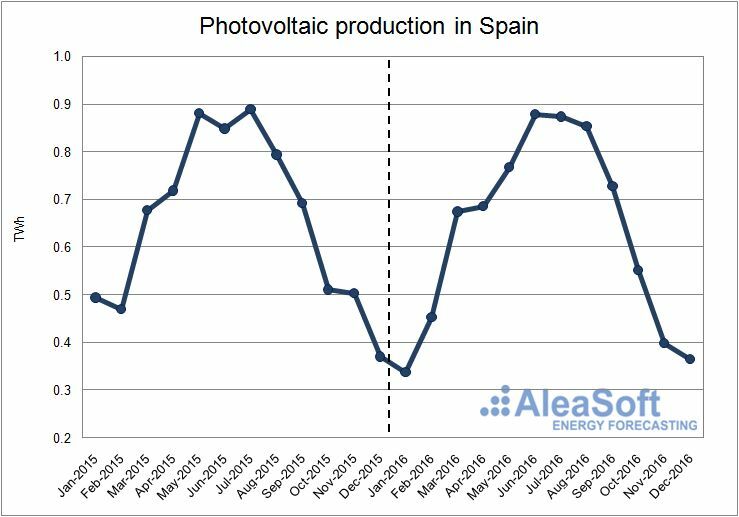 Solar photovoltaic production has fallen by 3.6% in 2016, while the installed capacity of this technology in mainland Spain has grown by 12 MW (according to data from REE) compared to the 10 MW installed during 2015, but far from the 403 MW installed in 2011, for example. 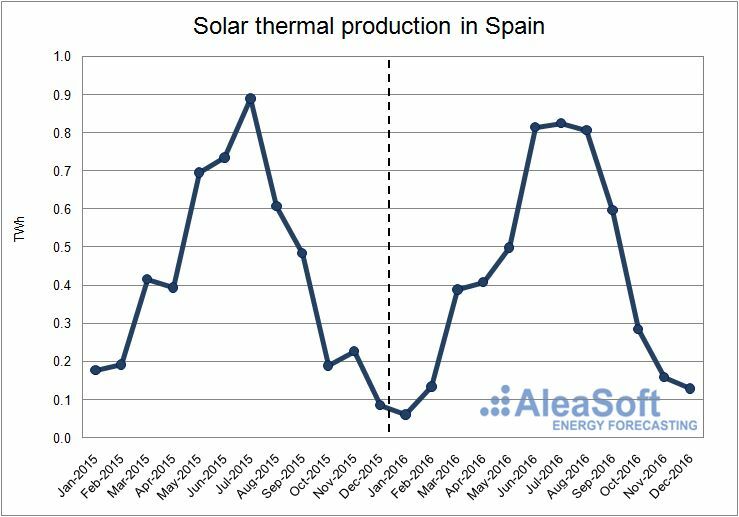 In the case of solar thermal production, there has been a slight increase of 0.3%. According to data published by REE, 2016 was the third consecutive year without installing a single MW of solar thermal power. 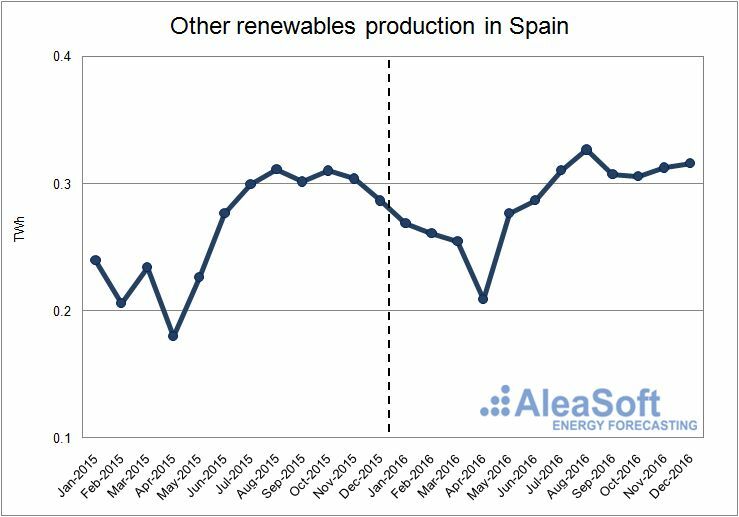 Other renewable technologies, including biogas, biomass, offshore hydroelectric and geothermal, have increased their production by 8.2% overall in 2016. The increase has occurred mainly in the first half of the year, 14.3% year-on-year growth, while in the second half of the year, growth has reduced to 3.6%. According to data published by REE so far, the net balance of installed power of these technologies during 2016 has been +0.3 MW. 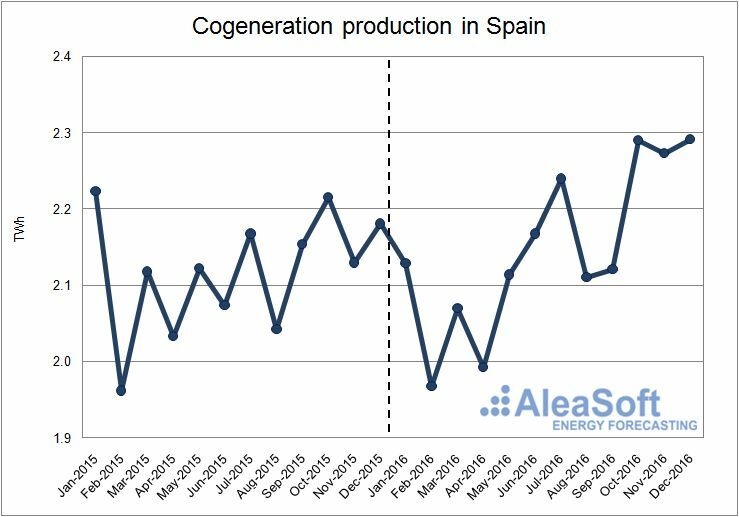 Cogeneration production has grown by 1.4%. The most significant growth was recorded during the second half of the year, with a year-on-year change of +3.4%. 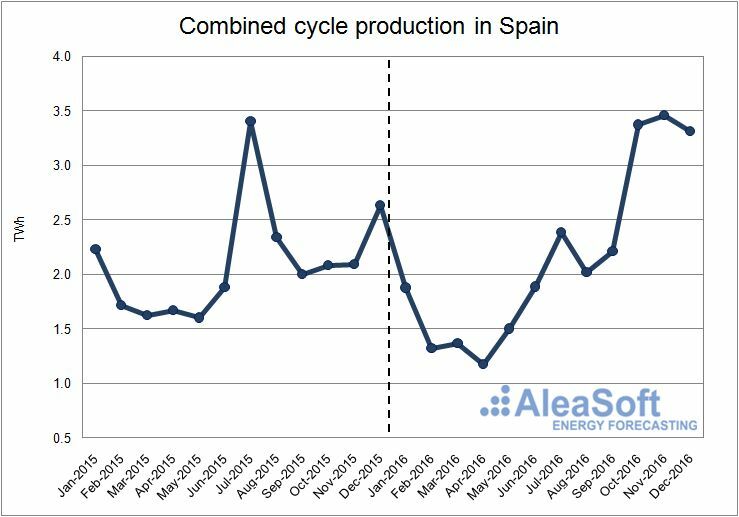 Evolution of cogeneration in Spain. Production using waste has increased by 4.7% this year. The highest growth occurred in the second half of the year, 10.7%, while in the first half, the year-on-year change was negative, ‑2.0%. 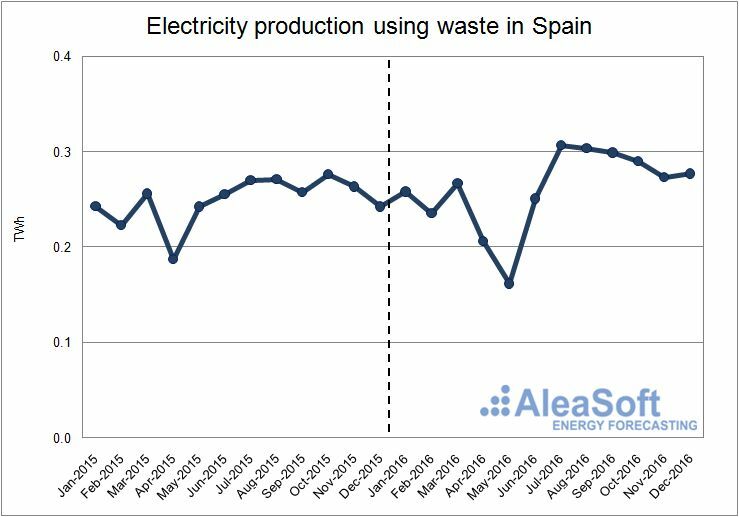 Evolution of waste production in Spain. It should be noted that, as 2016 is a leap year, this year has had one more day than 2015. This has repercussions on the growth values of gross demand and productions, which, only due to calendar effects, already include an increase of around 0.3%. 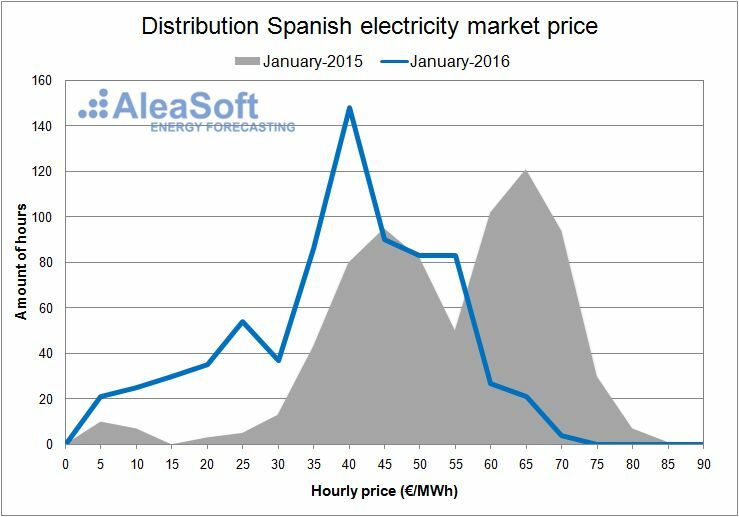 2016 began by prolonging the decrease in price of the main fuels for the generation of electricity which started in the second half of 2015. As of the second quarter, the downward trend slowed and prices began to rise. Even so, both Brent oil and Zeebrugge gas have not been able to recover values from early 2015. 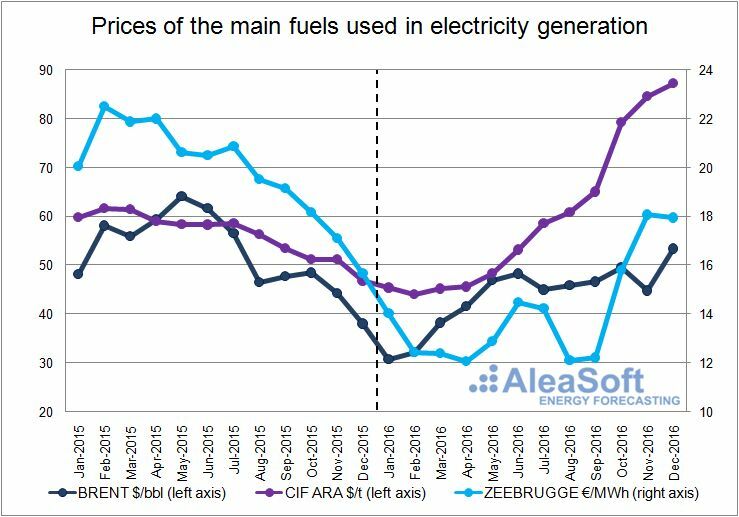 The Zeebrugge gas price hit bottom in April with a monthly average of 12.06 €/MWh. 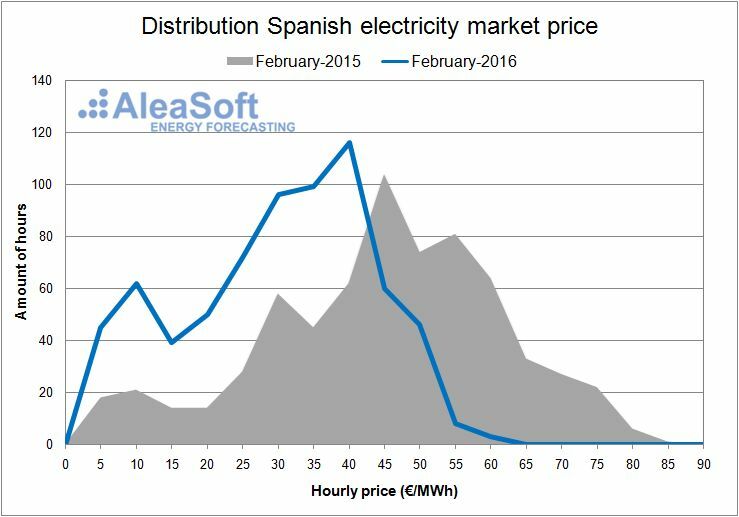 In November, the price had recovered to 18.07 €/MWh, but still far from the average of 22.50 €/MWh in February 2015. Throughout 2016, the price of a barrel of Brent oil has been recovering after the collapse of late 2015, from the monthly low of $30.70 in January to $53.35 in December. The price of European coal CIF ARA, which began around 45 $/t, began to rise in June and in the last quarter thanks to the increase in demand for the mineral in France, rebounded and closed in December with an average of 87.23 $/t. 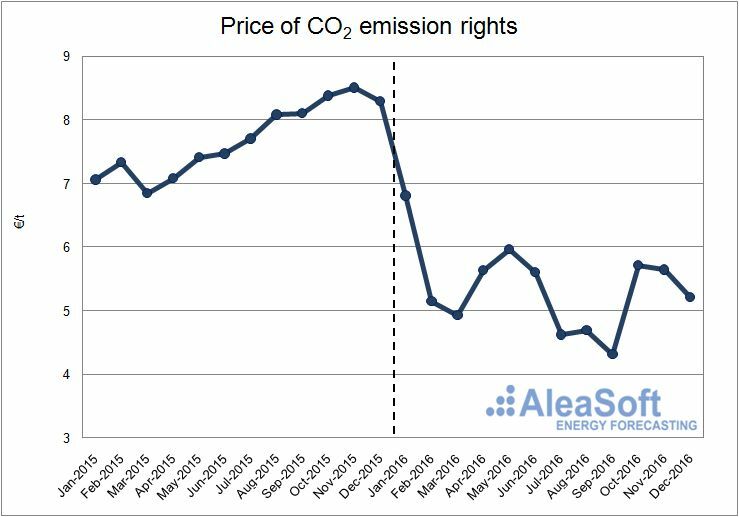 The average price of CO2 emissions rights in 2016 was 5.36 €/t, 2.33 €/t lower than the average price in 2015. The recovery trend that began in the second quarter of this year’s price of this product suddenly stopped at the end of June following the decision of Brexit, as the United Kingdom is one of the main Member States pro-EU ETS (EU Emissions Trading System). In the last quarter the price recovered to levels at the beginning of the year. 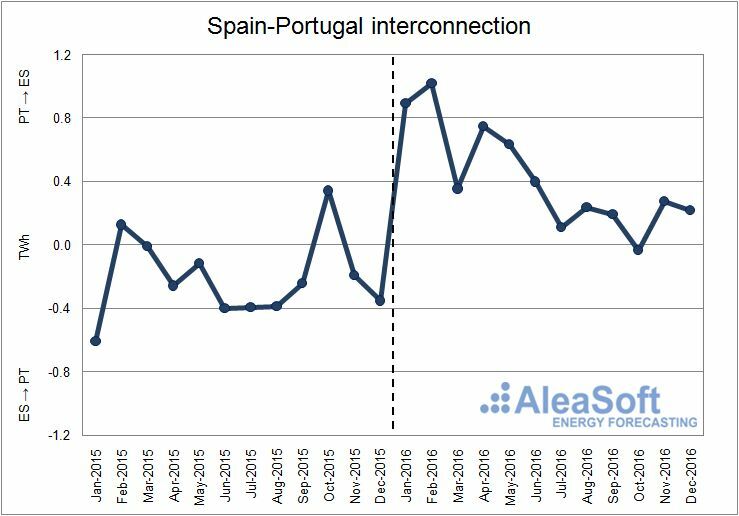 In 2016, the net balance of electricity exchanges between Spain and Portugal placed Spain as a net importer, with 5039 GWh imported, unlike in 2015 where Spain exported more electricity to Portugal than it imported. 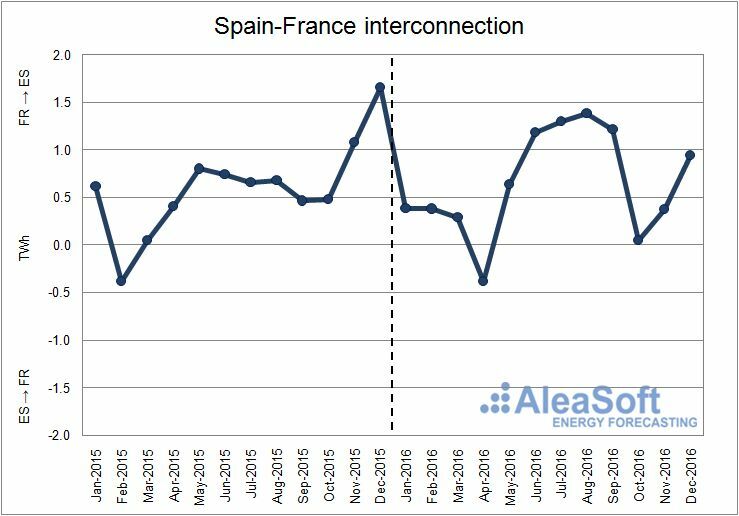 The net balance of electricity exchanges between Spain and France during 2016 placed Spain as a net importer, as was the year 2015. 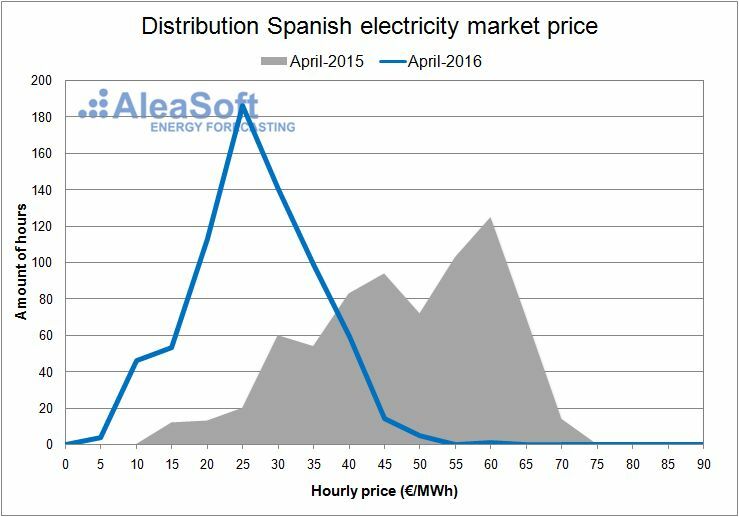 In 2016 Spain imported 7743 GWh from France. In October and November, trade was close to balance, as exports increased due to the increase in demand in France following the shutdown of many of its nuclear plants. 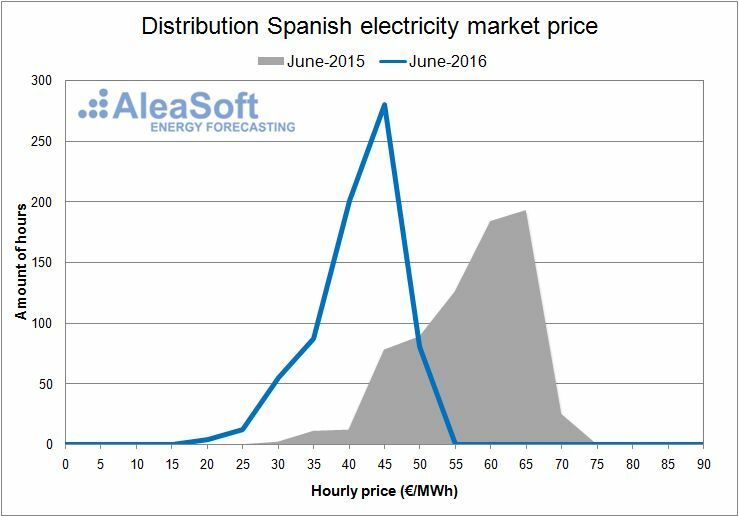 The average price of electricity in the day-ahead market OMIE in Spain in 2016 has been 39,67 €/ MWh, which represents 10,66 €/MWh less than in 2015. 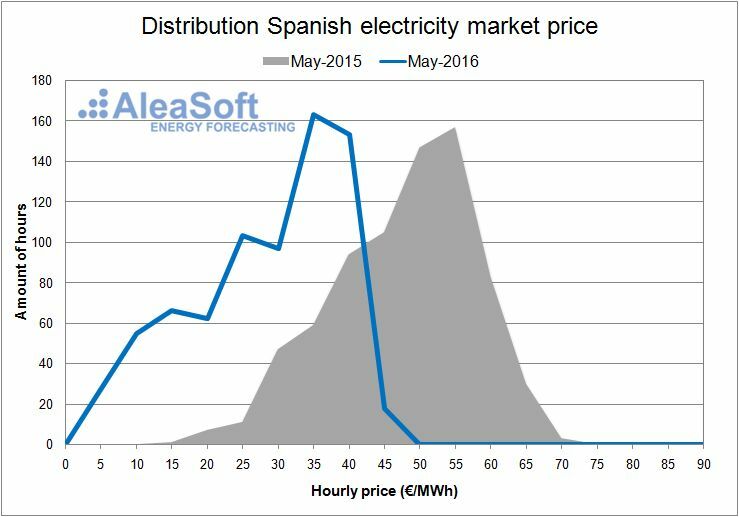 The largest price drop was during the first half of the year with an average price 17.01 €/MWh lower than that in the first half of 2015, a lowered price due, primarily to the increase in the production of electricity with renewable technologies as hydroelectric and wind power, and to the falling prices of fossil fuels used in electricity generation. 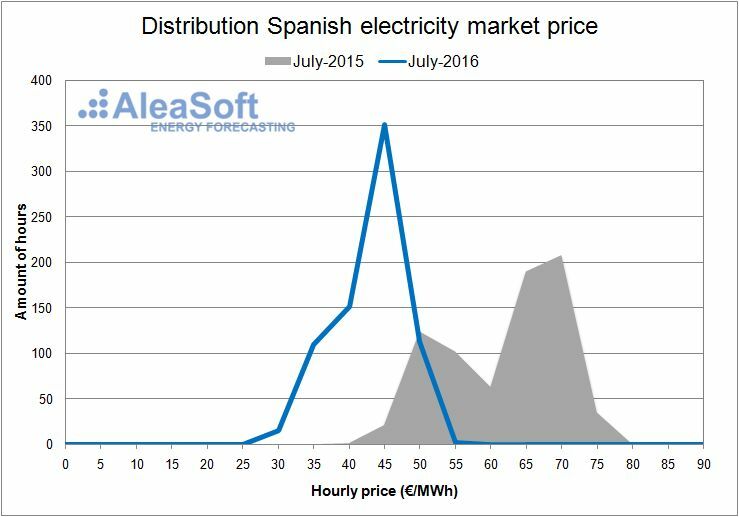 During this first half of the year the lowest hourly price of 2.30 €/MWh year took place. 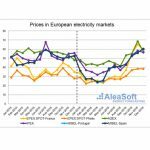 In the last quarter of 2016, a clear increase in price was recorded due to higher export of electricity towards France as a result of several of its nuclear power plants closing which provided most of the country’s electricity. 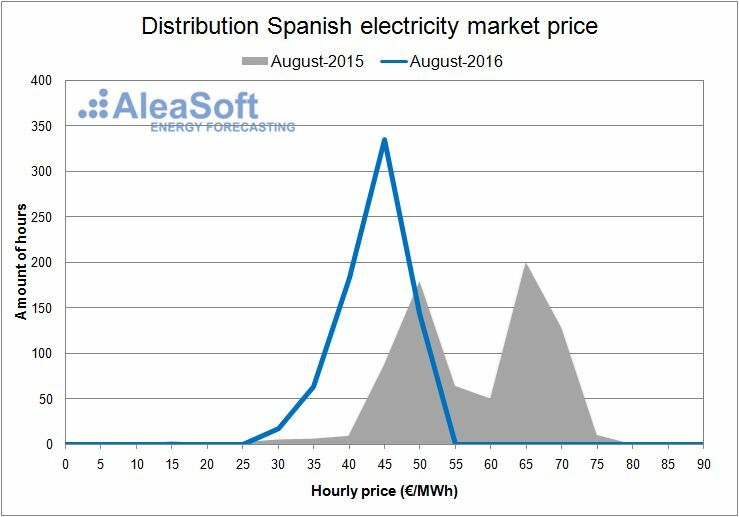 The average price during the last quarter reached 56.48 €/MWh, and exceeded the average price of the last quarter of 2015 in 5.25 €/MWh. 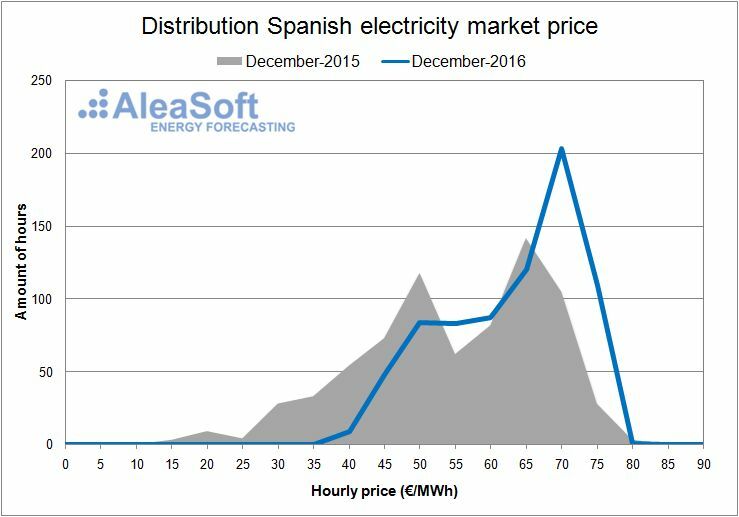 It was during this last quarter, in the month of December, that the most expensive hourly price this year occurred, 75.50 €/MWh, which was recorded on day 16 between 18:00 and 19:00. 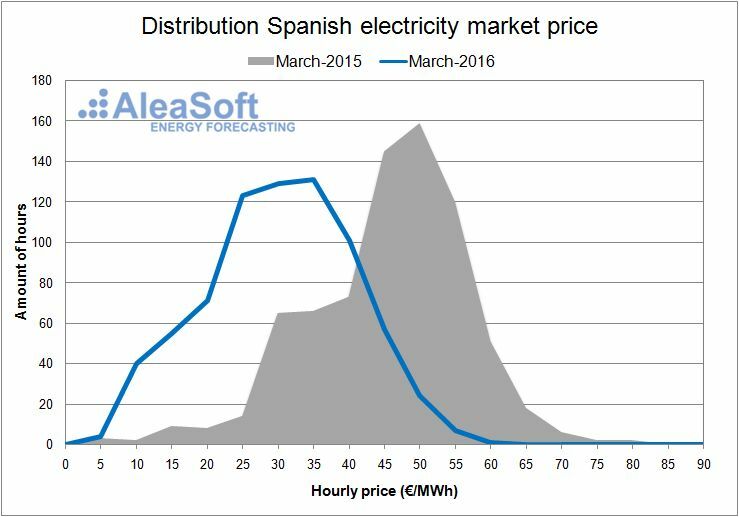 In the graph showing the distribution of Spanish electricity market price for each month of the year, one can clearly see that the prices for the first three quarters of the year 2016 are displaced towards lower values than in 2015, while in the last quarter, the behavior is the opposite. 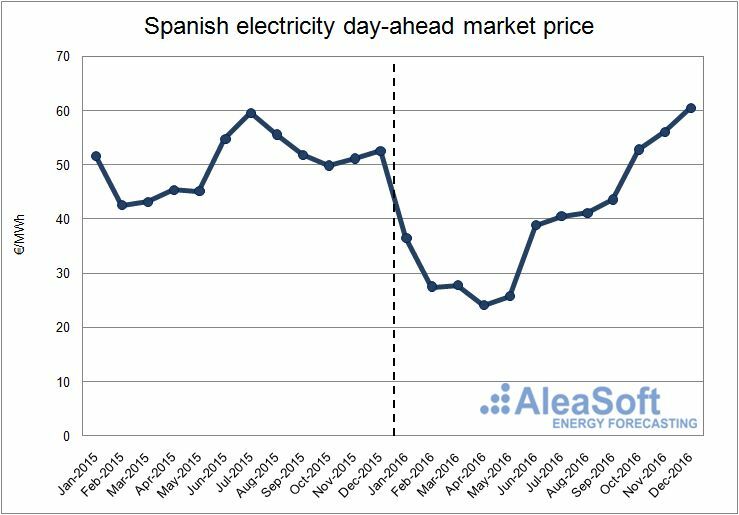 As for the coupling of the Spanish market with the Portuguese and the French markets, 2016 has reduced the number of hours in which the Spanish and Portuguese markets registered the same price. 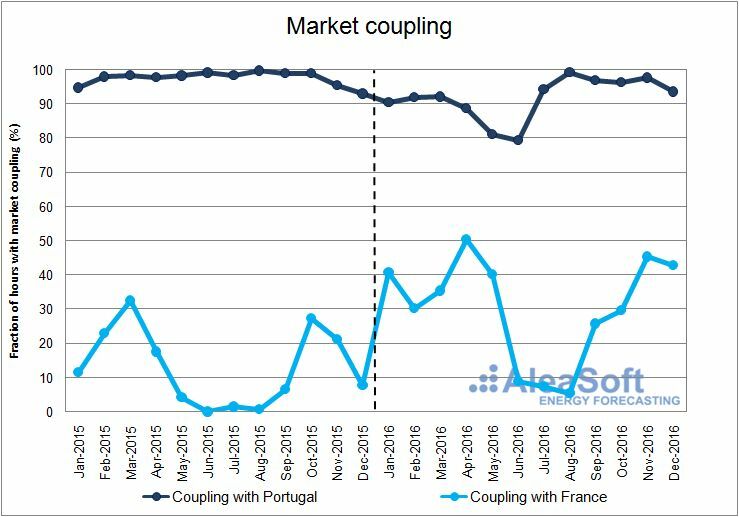 On the other hand, the number of hours with coupling with the French market has increased, partly due to the increase of the capacity of the interconnection between the two countries. Evolution of the monthly fraction of hours with market copuling with Portudal and with France.